Шорты из хлопка с технологией ClimaLite. What's the game plan for this week? 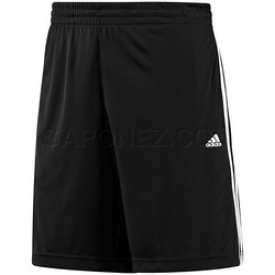 Make sure you're covered withadidas Essentials Shorts. Comfortable, versatile and made withsweat-wicking CLIMALITE® fabric, these athletic shorts will keep youfeeling like a champ. The fabric wicks and transports sweat away from the skin to theouter fabric face for quick evaporation. ClimaLite ® thus enhances thebody's natural temperature regulation functions.